[188 Pages Report] The increasing demand for clean drinking water and increasing awareness about the importance of water treatment are some of the major factors driving the growth of the water treatment systems (Point-Of-Entry) industry. The water treatment systems market (Point-Of-Entry) was valued at USD 3.51 Billion in 2014, and is projected to grow at a CAGR of 8.52% from 2015 to 2020. The filtration methods segment is the fastest-growing, by technology, in the water treatment systems market (Point-Of-Entry). In the region segment, Asia-Pacific is projected to grow at the highest rate. In terms of application, the residential sector is the fastest-growing segment, followed by the non-residential sector. This report provides an analysis of key companies and a competitive analysis of developments recorded in the industry in the last five years. Market drivers, restraints, opportunities, and challenges have also been discussed in detail. Leading players of the market, which include 3M Company (U.S.), Honeywell International Inc. (U.S.), Calgon Carbon Corporation (U.S.), Pentair plc. (U.K.), The Dow Chemical Company (U.S.), Best Water Technology AG (Austria), and Danaher Corporation (U.S.) have been profiled to provide an insight into the competitive scenario in the market. This research categorizes the water treatment systems (PoE) market based on technology, application, and region. This report provides five year market forecasts with important statistical and analytical information on the technology, and application. This report provides a list of regulations relevant to water treatment systems market (Point-Of-Entry) at the regional level. This report illustrates the industry structure, driving parameters, major players, market shares, industry dynamics, and international developments relevant to water treatment systems markets (Point-Of-Entry). This report provides detailing of each segment, on country level for a holistic view. The water treatment systems market (Point-Of-Entry) is projected to reach USD 5.69 Billion by 2020, with a projected CAGR of 8.52%, from 2015 to 2020. Growth in infrastructure, technological developments, and rapid urbanization has fueled the growth for water treatment systems (PoE). The residential sector is the largest application area for water treatment systems (PoE), especially in emerging markets such as China, Brazil, and India. 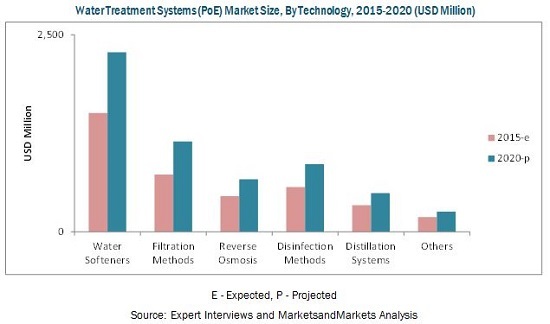 The water treatment systems (PoE) market depends on various players who provide technological solutions for installing and manufacturing innovative water treatment systems. The market is dominated by key players such as 3M Company (U.S.), Honeywell International Inc. (U.S.), General Electric (U.S.), Best Water Technology (BWT) AG (Austria), and Calgon Carbon Corporation (U.S.). The market in this report is segmented on the basis of technology, application, and region. The filtration methods segment is projected to grow at the highest CAGR of 8.52% from 2015 to 2020. The key players of the water treatment systems (PoE) market implement different strategies such as expansions, agreements, contracts, joint ventures, and partnerships to gain a larger share in the market. 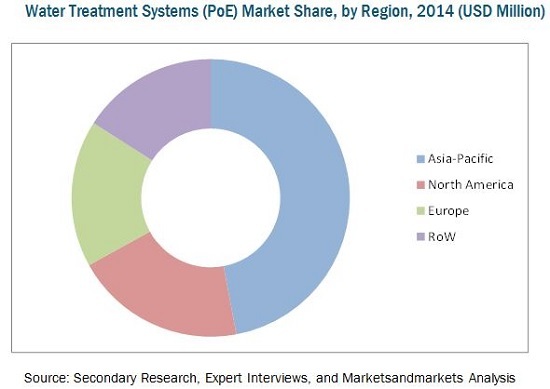 The water treatment systems market (Point-Of-Entry) is a highly fragmented one. Major companies rely on regional and local distributors to increase their share as well as geographical presence in the market. One of the major developments observed in the water treatment systems (PoE) market is new product developments. Companies are adopting inorganic growth strategies such as acquisitions to cope with the increasing demand for water treatment systems in emerging markets. These strategies have aided companies to create a large customer and partner base in these markets. 9.4.1.1 Intertek Testing Services and Underwriters Laboratories (UL) are Certified Systems Testing Laboratories in the U.S.
9.5.4.1 Water Regulations Advisory Scheme (WRAS) is the Approved Certified Body for Water Treatment Equipment in the U.K.
11.11 Watts Water Technologies Inc.